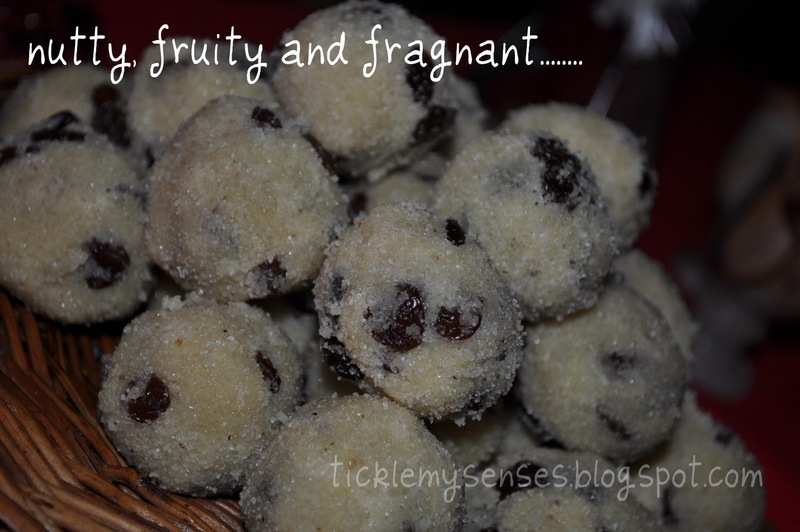 In the Christmas Sweets/Kuswar collection there usually tends to be atleast one sweetened ball/ laddu preparation made. 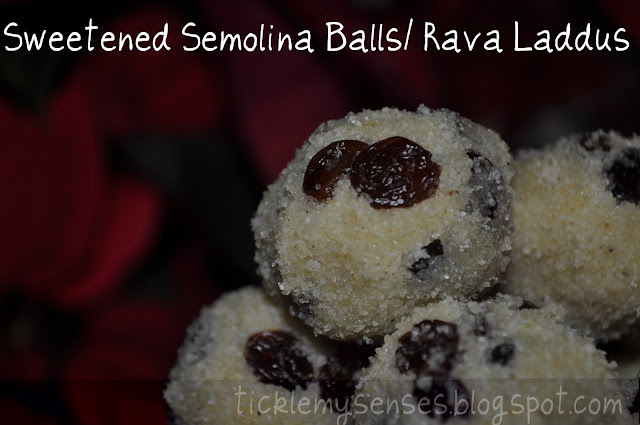 Out of the 3 most common sweetened ball/ laddu preparation ( rice laddu, sesame seed/till laddu and semolina/ rava laddu), my favorite is the Semolina/ Rava laddu. 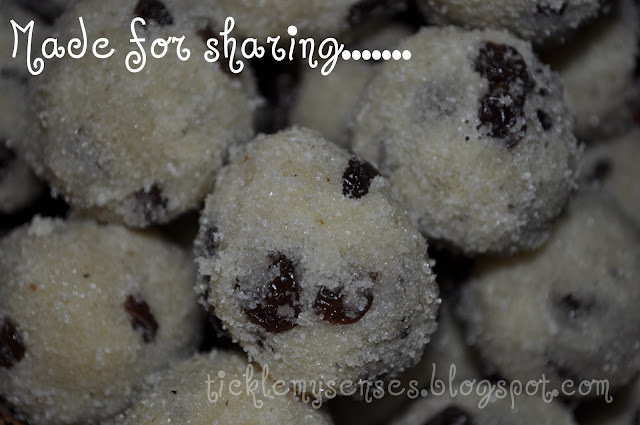 These balls or laddus are dead easy to prepare and very yummy. I had some condensed milk and almonds powder in my store cupboard so decided to put them to good use. You can also use roasted and chopped up cashew nuts instead. Just add the roasted nuts along with the raisins to the laddu mixture before binding together. 1/2 cup Ground almonds (can be found in bakery section of most stores in UK) or 1/4 cup chopped up cashewnuts. 1. Heat ghee in a pan. Fry raisins till they plump up. Keep aside (If using cashewnuts or any other whole nut, lightly roast the nuts in a little ghee, cool and chop them up). Add semolina/rava to same pan and fry over medium-low heat for about 6-7 minutes, turning frequently until the rava is evenly lightly golden in colour and fragnant. 2. Once semolina or rava is almost done, add the ground almonds to the semolina mixture and fry for a further minute, tossing about. Add the freshly ground cardamon and mix thoroughly. 3. Turn off the heat and stir in sugar and salt. 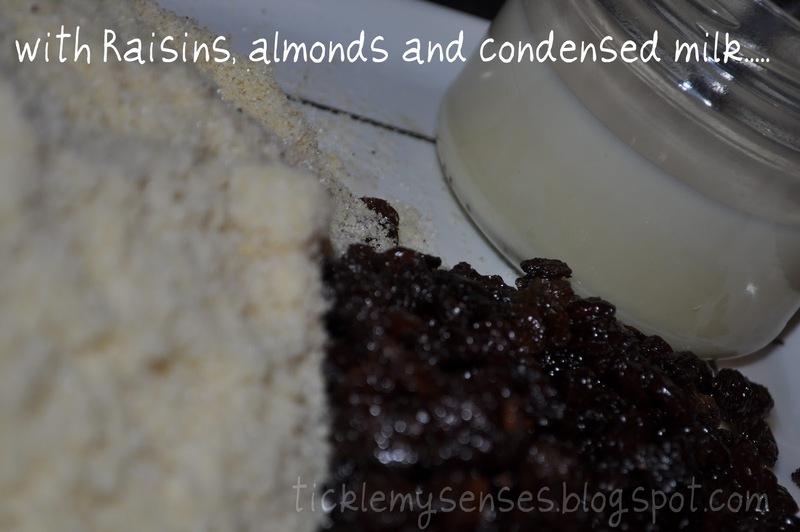 Add the raisins (chopped nuts if using). 4. Dissolve condensed milk in hot water. Add about 8-9 tbsp of this milk mixture into the rava mixture. Stir in and see if the mixture can be formed into balls within your palm. If the laddus disintegrate when you try to press it into a ball, add more milk mixture, a teaspoon at a time, until the right consistency is reached. 5. Shape about 2 tablespoons of mixture into laddus, till all the mixture is used up. Cool then store in an airtight tin. Keeps well for 3-4 weeks. 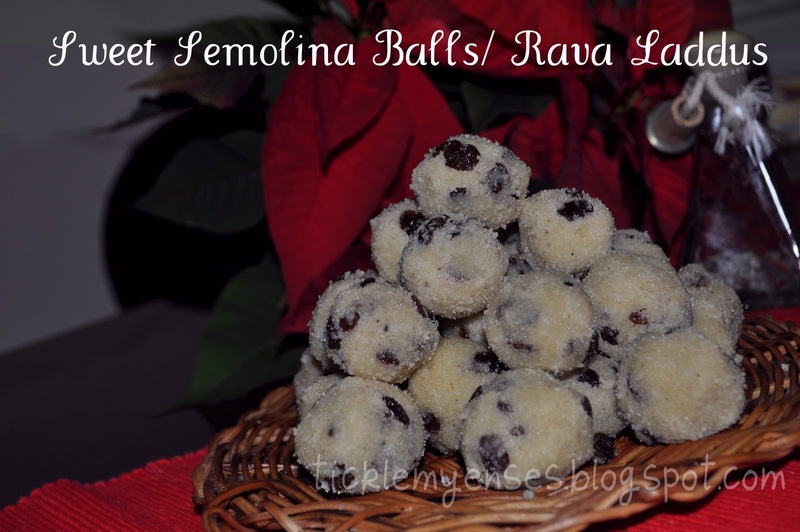 Rava Ladoos are my fav too Caysera!! These look terrific!! first time here,glad to follow you too..
Thanx for dropping by my space n follow too,Caysera..
Do visit again n Happy blogging..
Mouthwatering semolina balls. Thanks for sharing.